Cyclists, whose screening at the International Animation Festival in Annecy was also its international premiere, won the Jury Distinction award. 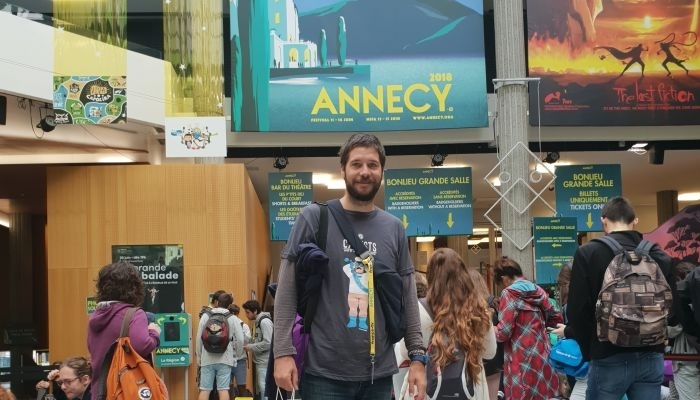 Annecy, one of the most recognized and renowned animation festivals in the world, was held from June 11th to 16th, 2018. ‘Ten years ago we debuted at Animafest and Annecy with our short film She Who Measures. Since then, we have met many new friends and fell in love with the world of animated film. This award now comes full-circle and has made these last ten years feel like a dream. I am looking forward to what the next ten years will bring,’ said Cyclists’ director, screenwriter and editor Veljko Popović. The film is a comedy spiced with eroticism and summer colours capturing the spirit of a small Mediterranean town inspired by the works of Vasko Lipovac. The animators are Goran Stojnić, Chloe Roux, Lucija Bužančić, Sander Joon and Mario Vrandečić, compositing is by Sina Jakelić, Gordan Mihalec and Darko Kokić. Music is by Pablo Pico, Siniša Jakelić and Nikola Džaja, and sound design is by Jean-Baptiste Saint Pol. The producers are Milivoj Popović and Veljko Popović (Lemonade 3D), and co-producers are Patrick Hernandez (Bagan Films) and Lado Skorin (3D2D Animators). The film is a Croatian-French co-production, and Bonobostudio (Zagreb) is the distributor. More than 3000 films from 93 countries applied to the Annecy Festival this year, and along with Cyclists, Petra Balekić’s “The Stranger” In My Head screened in the student competition while Anja Komfel’s debut film Chris the Swiss screened out of competition. Last year at this same festival, Eva Cvijanović’s Hedgehog’s Home won the Children’s Jury Award. The Annecy Festival is one of the oldest and most prominent animated film festivals attracting thousands of professionals from the world of animation each year. This year’s 42nd edition took place from June 11th to 16th. For more on the festival and a full list of winners please visit the festival’s official website.